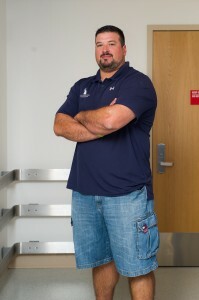 With six surgeries, multiple injuries, and many knee problems by the time he was 31 years old, three-time Super Bowl champion Joe Andruzzi was no stranger to doctors. But when the former New England Patriots player started experiencing stomach pains in May 2007, everything quickly changed. He and his wife, Jen, recently shared their experience at Dana-Farber’s 12th annual Young Adult Cancer Conference. Joe: I had just finished my tenth year in the NFL, and was ready to train and show people I still had something in the tank, because you get old really fast in the NFL. But I just wasn’t feeling right. I went to the doctor, had a CT scan, and I found out I had a large mass wrapped around my colon. I went through an abundance of tests and was diagnosed with non-Hodgkin Burkitt lymphoma. Former New England Patriots player Joe Andruzzi faced Burkitt lymphoma at age 31. How can I fix my husband? Jen: When you go to your first appointment, you think they’re going to diagnose you with the flu, give you medication, and you’ll be all better. This was not what was supposed to happen. The day we found out, we held each other on the couch and said, “We will get through this.” I went into robot mode thinking, “How can I fix my husband and our family?” We were preparing to move from Cleveland to New Jersey, but that planning mode went into making sure Joe got his scans and biopsies, and calling our friends at Dana-Farber to find out who the best doctor was. I didn’t know where my life was going. Joe: I spent more than 50 days in the hospital during three months of intensive chemotherapy. I don’t remember much because of chemobrain, but I vaguely recall Jen yelling at me to get me out of bed and walk around. But I just didn’t want to move. I don’t remember ever being like that. I had always been active, whether with football or just with my kids. Before cancer, I was a strong 330 pounds, and three months later I was 60 pounds lighter. Knowing I couldn’t get my body back to where it was was one of the worst parts of my treatment. When you’re done with treatment, you want to snap your finger and be back to normal, but it was far from that. I had a deep depression for months. I finished treatment as football season started, and for the first time in 10 or 20 years, I didn’t know what I should be doing that time of year. I didn’t want to leave the house. It was a day-to-day process. You’re going to have your ups and downs, but what matters is how you bounce back from being down. Now, there’s so much positive. Jen: No matter how many hugs I gave him or how much love our kids showed him, there was a time when we couldn’t pick him up. As the caregiver, it’s hard to see your loved one sad, upset, or sick. There was a dark time, but now there’s so much positive. Joe: Taking things day to day became week to week, and walking down the driveway progressed to walking the kids to the bus stop, then I got back into the gym. I remember lifting 100 pounds before cancer, but after treatment it was painful to lift only 20 pounds. I kept going and kept moving forward. I knew I had to pay it forward. Joe: After I finished treatment, a mom asked me to talk to her son who was being treated for Burkitt lymphoma. Before that call, I wanted to put cancer behind me. But after speaking to this inspiring young man, I knew I had to pay it forward, and my wife and I began the Joe Andruzzi Foundation to provide support to families during treatment. Walking into a hospital and getting a hug from a stranger you’ve helped is so rewarding. You story of your dealings with cancer are inspiring! I have been recently diagnosed with cancer. The hospital where the diagnosis happened gave me an application for financial help thru your foundation by was told funds were not available! Were you aware? Thank you for sharing your journey! Thank you for your comment. We’re very sorry to hear about your cancer diagnosis. The best way to find out if funds are available from the Joe Andruzzi Foundation would be to contact the Foundation directly. The email address is grants@joeandruzzifoundation.org. Thank you for sharing your story. In sickness and in health…disease can break a family apart or bring them even closer. I speak from experience as my husband was diagnosed with a rare form of ACC in the fall of 2013. Two surgeries, radiation and 4 types of chemo have not worked. Last week he was entered into a trial that we hope will stop the spread of cancer. We are very thankful for the financial assistance we received from the foundation and continue to fight the fight together.